How one man's experience at a fishing master class made him a fisherman for life. I was born and raised in Minnesota, the proverbial “Land of 10,000 Lakes.” My family cabin was on Sturgeon Lake, named after the massive bottom-feeders that anglers love to bring up from the deeps. You’d think, with a pedigree such as mine, that I would have a wall full of beautiful bass frozen forever in mid-leap. That I’d be able to fillet a walleye with one hand tied behind my back and my eyes closed. What you wouldn’t expect is that I would grow to the ripe old age of 30 (mumble) without ever having caught a fish. It’s not for lack of trying, mind you. I’ve gone fishing dozens of times. I’ve even taken whole week-long vacations devoted to nothing but the art of angling. It’s just, once I get out in the boat and cast a few times, that paperback book and cooler full of sandwiches look a lot more enticing than putting another worm on my line to feed that fallen tree I can’t seem to avoid. But when you work where I do, surrounded by champions and masters of every outdoor pursuit imaginable, you can only fudge the water-cooler talk for so long. So, when the opportunity came for me to spend a few weeks in Missouri, learning the art of bass and crappie fishing from some of the best anglers in the country, I knew it was too good to pass up. The opportunity? 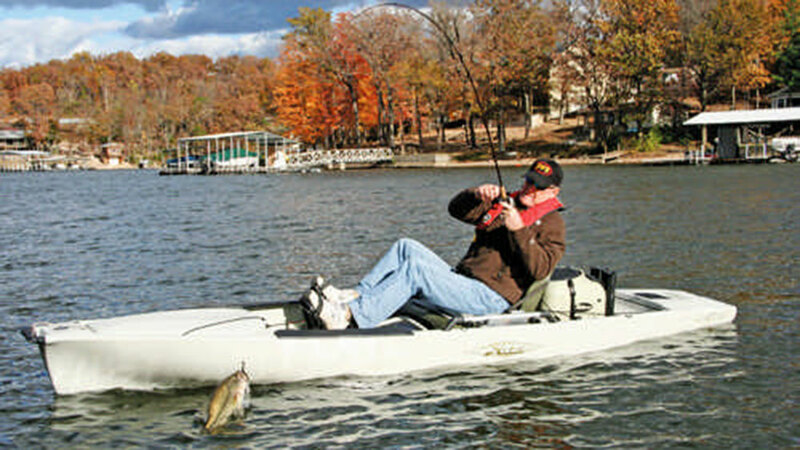 Spending two weeks getting a master class from pro fishermen who make a serious living wetting their lines – plus some pointers from the finest local guides Lake of the Ozarks has to offer. If I didn’t come back with the ability to hold my own around the water-cooler, I was going to have to rethink my chosen profession. I guess I could always be a kindergarten teacher – my students would have no idea how big a smallmouth bass really is. I arrived at Big Cedar Lodge on Table Rock Lake in Ridgedale, Mo., under the cover of dark. You know, like a ninja. And so I was wholly unprepared for the sweeping vista that greeted me the next morning. Laid out before me was one of the most beautiful bodies of blue water I had ever seen. Nestled between two massive cliffs of green – against which were perched lovely lakehomes – it called to me. There’s lots of fish in here, it seemed to say. Even you won’t get skunked! I headed down to the docks and met up with my boat crew. 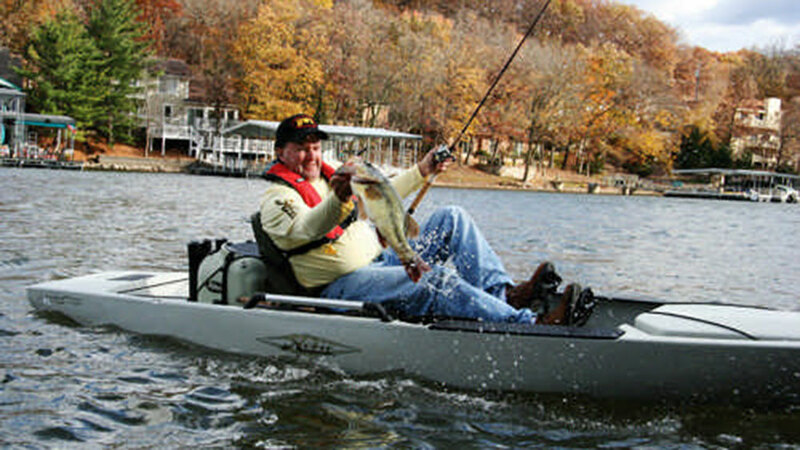 I’d be learning from Terry Scroggins, a Toyota-sponsored Bassmaster Elite Series Angler. He was standing aboard his boat – a sleek, spartan dagger of a craft that screamed two things: bass and speed. He helped me aboard with a strong handshake and broad smile, and immediately cracked his first of the innumerable jokes he would lob at me all afternoon. He was warm, jovial and had a rich, Southern twang that spoke of ice-cold lemonade and lazy Sundays in the hammock. It should come as no surprise that I liked him immediately. One thing I did not like, however, was racing across Table Rock Lake a few days before Halloween. Being from Minnesota, I had taken a quick glance at where Missouri was on the map, saw everything I needed to know (it’s south of Minnesota) and packed a bunch of shorts and T-shirts. Terry got that boat up to what seemed like a zillion miles an hour, and I began to wish for the sweet relief of death. Or at the very least (and only slightly less melodramatic) – a hot chocolate. I pulled the strings on my hooded sweatshirt as tight as I could, leaving only my nose exposed to the elements. But before too long, we found ourselves out of the wind and in the sun, tucked into a cozy little inlet off the main part of the lake. We started trolling. He put me in the back of the boat, which I thought was quite magnanimous, as there was a very comfy chair there. Then I heard him say something about first water and realized he wanted the first shot at the fish. Okay, fair enough. His boat, his rules. We trolled for a long while, idly passing by a seemingly endless stretch of shoreline. He caught four without batting an eye. I still was fishless. And I couldn’t find a book or sandwich anywhere on that boat. He must’ve noticed my growing frustration, because before I knew it, he had reeled in his line and set it down. His eyes were scanning the shore. Searching for something. Then, suddenly, he found it. “Cast there,” he said, grinning like a madman. I followed his finger to a narrow slot between two massive submerged boulders just a few feet off shore. The water lurking between those boulders was inky black. Nice and deep. I nodded, praying that this was the one time in my sad sporting life that my hand-eye coordination didn’t betray me, and I let my lure fly. It soared across the gap between the boat and the rocks, skipped off the side of one of them and plunged into the dark water. And he barely got those two words out before my line gave a sharp tap-tap and the line began to zoom from my reel. “Set that hook!” he commanded. And I did as I was told and had been taught all those years ago. I reared back and to the side, making sure the hook was set solid in the fish before reeling it in. He helped me get the hook out and snapped a couple pics of me holding my meager trophy before I released it back into the water, where it disappeared with a splash of water and a flash of silver. I caught a half dozen more before that single day of fishing was done. And some of them were a lot more worthy of a photo. But none of them meant as much as that first one. I was a rookie no more. 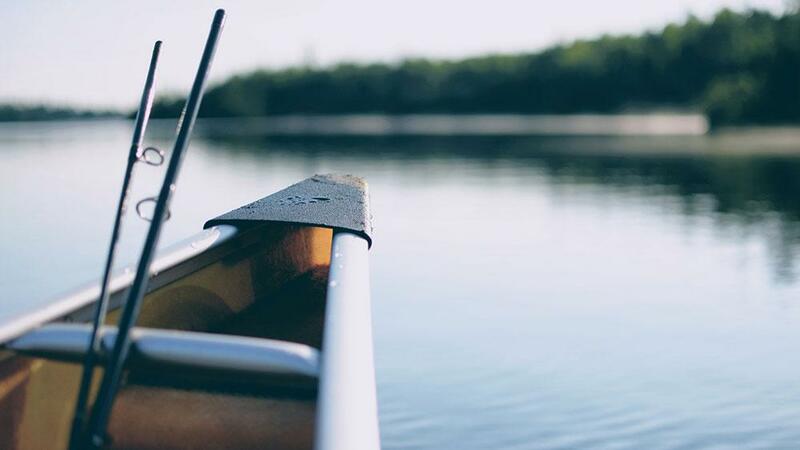 The next week, I found myself staring out at another beautiful expanse of Missouri water, Lake of the Ozarks – the massive, snaking body of blue that hugs some 1,100 miles of shoreline. From my room at the Alhonna Resort and Marina, I had a clear view of the waters where I would be fishing for a species I had never even attempted to catch before – the fun-to-catch and delicious-to-eat crappie. This spirited member of the sunfish family is a regular favorite of anglers who love a good fight. 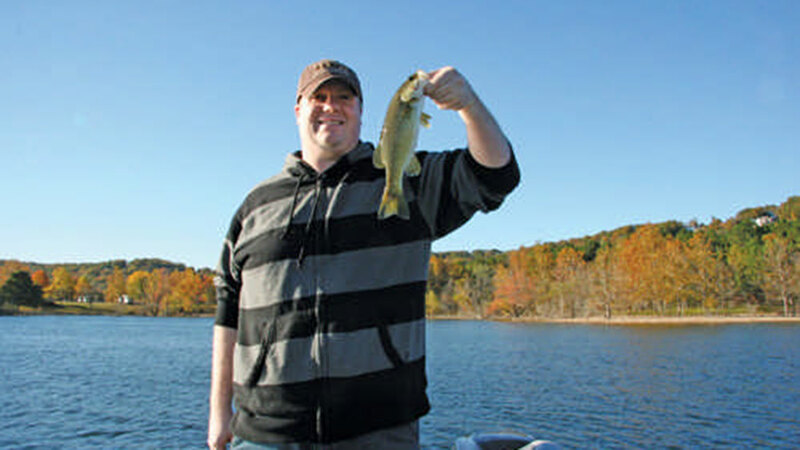 And, after my recent crash course and half-dozen bass catches, I was itching for a fight. My guides this time would be a pair of local crappie experts, Charlie Rogers and Terry Blankenship (apparently, if you want your kid to be an expert angler, naming him Terry is a good start). We had dinner the night before the fishing began, and we talked strategy. I boasted about my first few catches and tried to keep up with them as they talked shop. Anglers have a private language. It’s cryptic and confusing and filled with colorful terms like “bimini twist” and “hickory shad.” And it can act as a pretty substantial barrier between the rookie and the tips and advice that get passed around freely inside the world of fishing. So when someone told me that, “The secret to not getting a birdnest in your baitcaster is to get your thumb on the line before your gizzard popper hits the water,” I nodded and smiled, and then quickly excused myself so I could pull up Google on my cell phone. I went to sleep that night more than a little nervous. Where Terry Scroggins had borne my inexperience with a patient smile, these guys meant business. I had the distinct feeling I would be expected to either hold my own or sit quietly and let the real fisherman work. Unable to sleep, I practiced tying some jigs for a bit, staring out at the inky black water of Lake of the Ozarks. I hoped the fishing would be good. The next morning I climbed aboard the boat. I had packed better this time, and boy was I glad for warmer clothing. November in Missouri can be quite cold, and the mist that hung over the water gave the lake a ghostly, foreboding quality. As we headed out to one of Terry’s favorite crappie locations, he told me the story about his first time crappie fishing. And about how he knew the moment he caught his first one that he was going to be a fisherman for life. He said when that happens to a person, they get a look about them – a look that’s unmistakable. It was a great story, full of color and life. Why is it that fishermen always seem to be incredible storytellers too? It goes with the territory, I guess. After all, fishing is one of the only pursuits in the world where the stories of failures and missed opportunities are often more fascinating than the stories of world-record catches. Can you imagine a football player regaling the locker room with the Tale Of The Pass He Dropped? Before too long, we reached the fishing spot. A wide-open stretch of water nestled into a little bay. Below us was what Terry called some “sweet structure” – fallen trees that created perfect little places for crappie to congregate. I pulled out my rod, said a little prayer for birdnest-free casting, and wetted my line. And no sooner had the lure disappeared below the surface than I felt the now-familiar tap-tap-TAP on my line. Startled, I set my hook and reeled in my line as fast as I could. Suddenly, a flash of silver split the water and leapt into the air alongside the boat. I had caught a big, beautiful crappie on my very first cast. As I brought it into the boat and removed the hook, I realized my companions had gone quiet. I turned to look at them, and they were standing with their rods still tucked away, smiling. They exchanged a glance with each other, nodded. “You got the look,” Terry said. I caught over two dozen crappie on Lake of the Ozarks, and by the end of the week I was spinning yarns full of colorful words like I’d been doing it all my life. When I got home, I lovingly stored my gear in my basement next to my long-since abandoned golf clubs and tennis racket. I looked at the dust covering those pieces of equipment and knew I’d never ignore my fishing gear like that. I was a fisherman now. For life. Moments after my first catch I was contemplating my taxidermy options and what room in my house I should hang my trophy. I was thinking so hard I couldn't hear my fellow anglers laughing at my "monster" fish. Keeton, from Hobie Kayaks, shows us all what he pulled out of the water. I'm surprised my hands were able to hold the camera steady, as they were shaking with jealousy. You guys are all much better at this whole fishing thing than I am. But I can solve a Rubik's cube. Can you? Yeah, take that! Andy Bennett often finds himself thinking of crisp autumn mornings on a boat, reeling for all he’s worth as the sun burns off the fog. And he rarely gets birdnests anymore.